By the end of July I know that I need to start getting my children mentally ready to start back to school. It takes them a few weeks to wrap their minds around going back to school and losing the freedom of summer. 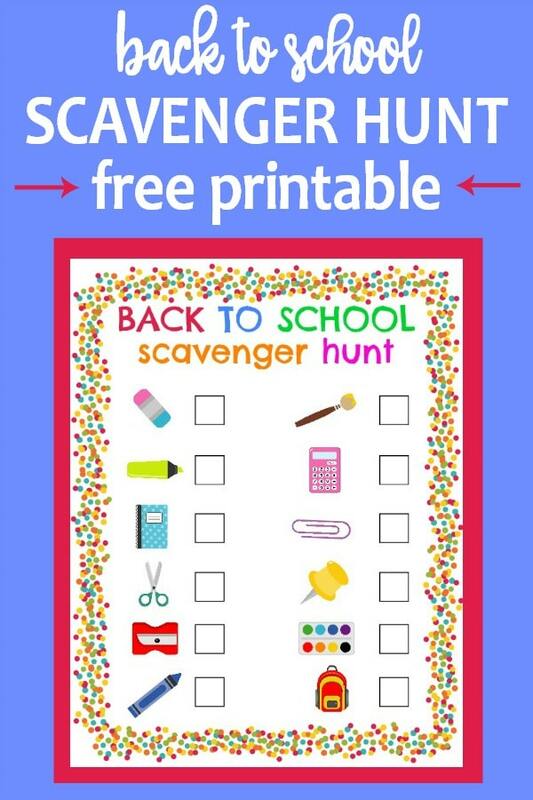 One fun way to do it is a back to school scavenger hunt! There are so many fun things about back to school time. Shopping for a special outfit for the first day. Taking special photos that morning as you head off to a new grade. Buying school supplies is also something my kids love to do. 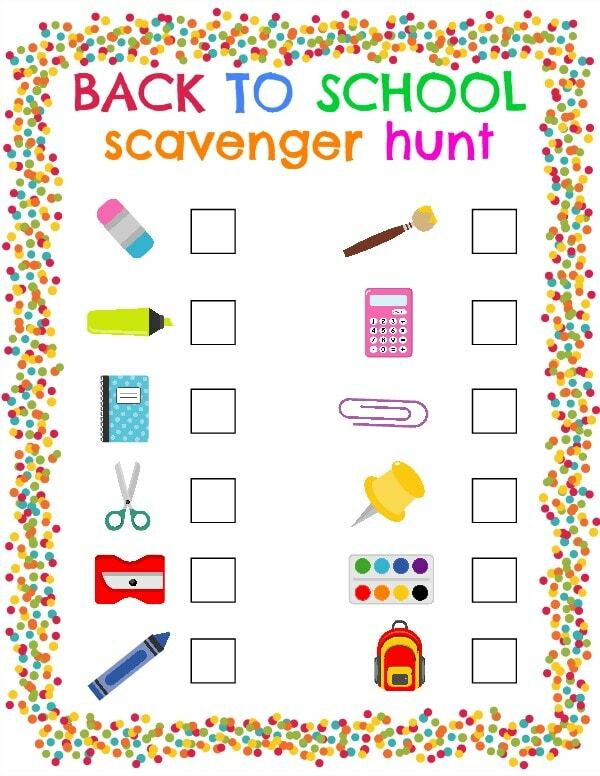 A back to school scavenger hunt is all about school supplies! So it goes right along with getting in the mood for the new school year. I love finding fun free printables to use with my kids. Scavenger hunts keep the kids active and occupied! First I print off enough copies of the scavenger hunt for my kids to use. I may laminate the copies so that we can use them again the following year or really anytime. I also like to print these off on white card stock so they are sturdier. Then I grab some clipboards and pens to make it easy. We play the game two different ways. The first way to play is to have the kids search for the items on the scavenger hunt around the neighborhood. We are lucky to live in a small, safe neighborhood. There is practically no traffic and there are lots of kids in the area so people drive slowly. The kids will go to a neighbor’s door and ask if they have anything on the list that they could either have or take a picture of for the game. If you don’t have a good area for going door to door then you will want to play the at home style! The other way to play is to just do the hunt in your own home. Since we keep most of our office supplies in the same area of the house…I like to hide things all over the place to make it more challenging. The kids will gather the items and may try to see who can get all the items first. It can be fun to have a whole day of back to school fun. We may start with a game of Back to School Bingo and then move on to the Back to School Scavenger Hunt. Then we will work on packing our school supplies in our new backpacks. Later I will do a little lesson with the kids on how to pack their own lunch boxes. Then I like to go over how our morning routine is going to go so there are no surprises! What does your family like to do to prepare for the beginning of the school year? How will you play the scavenger hunt game? Love scavenger hunts? Grab two more (one for indoors and one for outdoors) in my post on Scavenger and Treasure Hunts. To get immediate access to ALL of my free printables (including dozens of other games for kids), subscribe to my newsletter. You’ll get a special one-time offer on my Printable Game Cards, plus instant access to my subscriber content library. Don’t want to sign up but still want the game cards? No problem! You can buy them for full price by clicking the “BUY NOW” button below. Jamie is a small town girl who loves being a wife, mother, and child of God. She is working hard to recapture the joy in her life after a few years of drought. Join her on her journey at Life is Sweeter by Design.